Let me show you my new watch from Daniel Wellington, a Swedish brand of classy and fashionable watches. 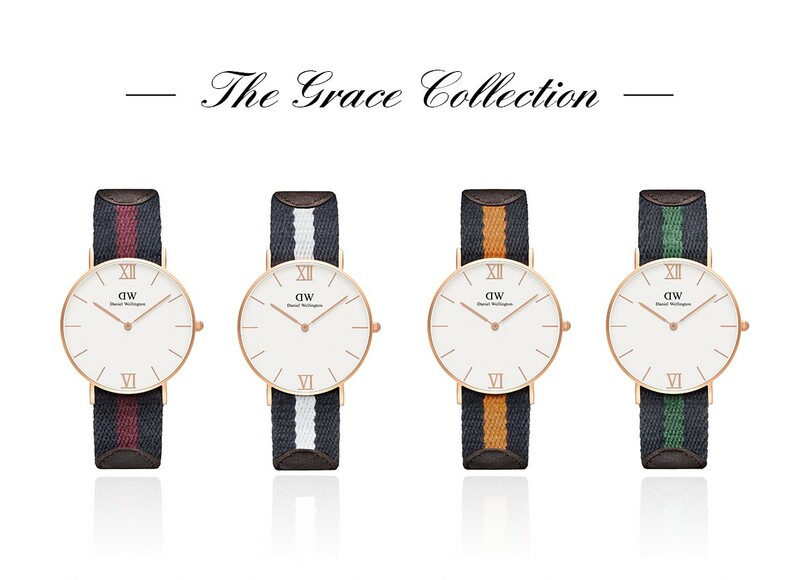 The founder, Filip Tysander, was inspired by a British gentleman, Daniel Wellington, who wore his watch on old Nato straps. Filip Tysander enjoyed that idea and was fascinated by his flawless style and fashion sense, so much as he created a line of watches, naming it Daniel Wellington in his honour. Personally, I fell in love with all the DW watches, what I like most about them is their preppy and smart line: a plain and basic accessory perfect for every occasion, from the more elegant to the more casual one, keeping the mood effortless chic and very refined even on the simplest or sporty outfit. Wearing one of these beauties really changes the whole ensemble and how you feel about it. I was in trouble to pick only one as the collections are really gorgeous. At last, the Grace London model from the Grace Collection was my choice: the edgy navy style and the old-fashioned design are the features that caught my eye. I paired it with a cosy and comfy outfit while I was on holiday (the photos below have been taken where I stayed in Fuerteventura): denim, linen and a dash of red seemed the perfect match with it; it goes very well also with heels and a more feminine look. It perfectly suits the menswear as well, being an unisex model. Ottima scelta, è un bellissimo orologio! Lilli sei bellissima in queste foto! Adoro loutfit e che bello l'orologio!!!! Don't forget to check my Shopbop gift card giveaway!! Very nice watch Lilli! I like that it isn't a common feminine watch. I visited the site. And your photos are so beautiful! I'm jealous of the swimming pool! Bellissimo questo orologio, davvero chic lilli, come anche il look e la location! Trovo fantastici anche i pantaloni! Oh my Lilli I love how this watch looks. I like that it's not so "girly" looks very casual but still elegant. Wow! you had me at Genuine leather. I will check them out. adoro questo marchio, i suoi orologi sono stupendi hanno classe e sono perfetti con qualsiasi look. Anzi, secondo me, sono loro che cambiano i look dandogli un valore aggiunto. Ottima la tua scelta, anch'io avrei preso questo modello. Sono molto eleganti gli orologi di questo marchio! Bello anche il tuo look! Buon week end Lilli! Hi Lilli, so happy to have you back! This watch is something I would pick out for everyday wear, its really modern and sophisticated and I like watches that are not too over the top and blinged out, Your sophisticated outfit is the perfect styling for it! Thanks for sharing your opinion with me. Wishing you a warm and wonderful weekend! I've been wanting a Daniel Wellington watch for the longest Lilli! They are gorgeous! I love the faces of them and interchangeable bands. I like the navy and pink preppy ones. They're excellent watches. You lucky girl! It looks gorgeous on you! Enjoy and Happy Weekend! Bellissima scelta, hai ragione sono tutti molto belli...e di gran classe. Indossato poi fa una gran figura! This brand is new to me but I can see why you like your new watch so much. It's so classic and smart looking and you made a great choice. It pairs perfectly with your comfy chic holiday outfit! Have a wonderful weekend dear Lilli! Wow, i´m a little bit jealous, you got the Blogger watches. II saw the watches at a few other blogs and everytime a thought, how nice this watches is. I like the clean style of this watch. You can wear this with so many difference style. And i like the idea to wear it with a men-suit. Your cosy vacation outfit goes very well with this watches. Eh ma che bel posto Lilli!! Io sarei rimasta lì! :P Bellissimo questo orologio, mi piace molto la variante che hai scelto tu!! Very nice watch Lilli. I never knew that the Brand is from Sweden inspired by a British Gentleman. Your denim shirt is so stylish. Looks like your vacation in Spain was fabulous. This watch is fabulous and looks great on - I have not heard of the brand before so thanks for telling us about it. Hope you enjoyed your holiday and it looks like a lovely place. Very nice design! Love your watch!!! adoro questi orologi! Buon week end Lilli! I have heard of DW watches. Yours looks very nice! Love the outfit that you're wearing in these photos. Bellissimo Lilly, elegante e casual al tempo stesso. Bellissimi gli orologi di DW, sono molto eleganti e chic!! Thanks for kind and wise words over at mine Lilli, to me you are one of the most thoughtful people Ive ever met! Ciao Lilli, questo orologio è molto bello e sofisticato. Mi piace il look da gentleman con cui l'hai proposto! mi piace molto il tuo look sportivo!! Ciao Lilli! Sì, conosco questo marchio. Trovo che il loro orologi siano di gran classe. Molto bello quello che hai scelto. Oh this is super pretty! I've been wanting to get myself one of those for so long and I think you just convinced me that it's time to do it hahah! You are totally rocking that DW watch....will have to check out their collection!!! Ciao Lilli! Che bello questo orologio e mi piace molto anche il tuo look! ciao Lilli! gli orologi DW sono molto belli, mi piace molto quello che hai scelto. Il cinturino è davvero bello e elegante. Non potevi afre scelta migliore! E poi sei bellissima con quel look, anche a me piacciono molto le camicie in denim e i pantaloni sono top! E' un bel completo, lo porti davvero bene. Che bello il cinturino che hai scelto per l'orologio *_* questi orologi poi sono veramente stupendi! Hi Lilli, great photos and watch. I love the way they look. Hope you had a wonderful and sunny weekend. Good afternoon Sunday Lilli. What a beautiful line of watches. And I what I love most about is his Logo got created the D in backward - so interesting in a way and make the brand standout. you looks very pretty in a casual pool side picture taken. Enjoy the rest of your weekend dear Lilli. Many kissesss,. Ciao cara, bello l'orologio che hai scelto! Perfetto il tuo look confy, easy e super trendy.... mi piacciono quei pants morbidi con la camicia in denim e il tocco di colore delle sneakers!!! Splendida la location.... quanto vorrei vedere Fuerteventura!!!! Ciao Lilli. Gli orologi di questo brand sono molto belli. Probabilmente anch'io avrei optato per quello che hai scelto tu. Molto carino anche il look con cui l'hai indossato. Un bacio.